Saving energy and implementation of new, environmentally friendly technologies are very important parts of our policy. Our production is energy saving and follows all of the known standards. It is a great responsibility, which we are aware of and in a long-term, we beleive, it will also give economic results. Energy which is re-introduced into the production process is environmentally friendly, and the materials are free of heavy metals. Cooling is regulated with a closed system. The same system provides the heating, and thus the electric and thermal energy are recycled. The latest procedures in galvanisation enable clean wastewaters, which are constantly supervised by an independent monitoring. Hydraulic machines have inverters for economical usage of the electric energy. Electric machines are more frequently used in production process, because, under right conditions, they spend less energy. We use an efficient air ventilation system, which reduces the consumption of energy. Air conditioning units are used only where really necessary, and they have in-built inverters for economical energy consumption. Storage room is economically used by means of special mobile shelving, which consequently means space, waste and energy saving. 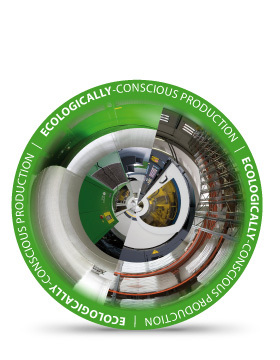 We are constantly following innovations in the field of environmentally friendly technologies and are introducing them into our production processes to save our environment for future generations.